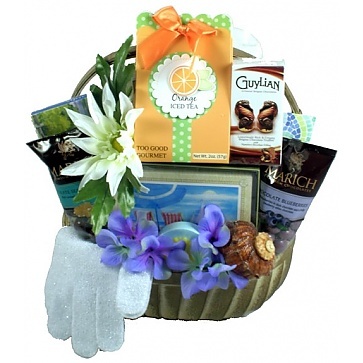 This special spa and sweets basket offers a collection of seaside themed gifts and goodies designed to promote peace and relaxation and total enjoyment. This very special spa gift basket for her is perfect for when she needs some "Me Time". With keepsakes, bath products and sweets, this bath gift basket could be a whole afternoon of self indulgence for someone special.